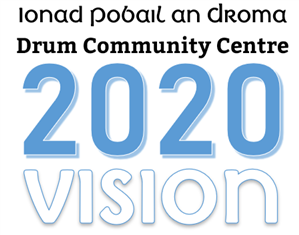 Drum Community Centre will hold a facilitated workshop on Sunday 24th March from 5-7pm for users of the centre and indeed the wider community to participate in developing its “2020 Vision” with plans and priorities for for the next 5 years. This month marks the 31st anniversary of the community centre’s official opening in March 1988, which was the culmination of four years of fundraising and planning by a local committee whose vision was to provide a sports and leisure facility for use by all of the community. It is therefore fitting to reflect on the achievements of the past while also looking at what the future holds for the community facility at Summerhill, Athlone. 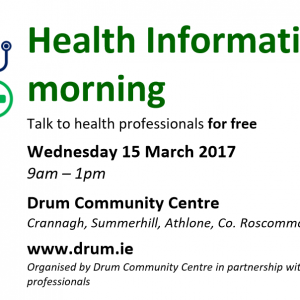 The committee has engaged an external facilitator to host a workshop for people who use the centre or have an interest in its future development to come along and share their ideas. 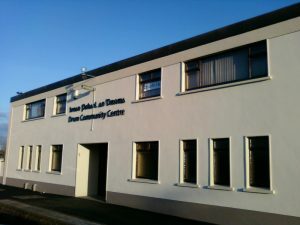 The community centre’s facilities are now used by a much broader community than ever before, reflecting the greater cultural diversity of those now living in the greater Athlone area. The current committee is keen to thank all those who have given generously of their time and effort to keep the centre running throughout the years. “Volunteers have always been at the heart of the community centre and it would not be here today without their dedication and commitment” according to Aidan McEvilly, Company Secretary. This is particularly evidenced by the high level of bookings and activities over the past year, despite the fact that the manager’s position has been vacant for 18 months. This vacancy presents the ideal opportunity for new committee members to set out their vision for the future management of the centre and then employ a new manager to implement it. Participants of the Community Employment Scheme and Rural Social Scheme also make an invaluable contribution to the upkeep and maintenance of the community centre throughout the year. The aim of the workshop on Sunday 24th March is to engage with those who use the community centre and have in interest in its future, to share ideas without commitment or obligation to join a committee. For those who might wish to get involved, there’s a variety of potential roles from board members to bingo volunteers, depending on people’s skills, interests and availability. Most of the current committee members have been involved for many years now; indeed some of them have been there since the community centre was first proposed 35 years ago. Their vision has been implemented and a number of them are due to retire this year, paving the way for this so-called “2020 Vision” which aims to get new people involved, to represent those who use the facilities and bring forward new ideas for the future development of the centre. The community centre operates as a company limited by guarantee on a not-for-profit basis; the finances are stable, it is fully paid for and has no debts. The biggest challenge facing the company at present is to engage a new generation of members and put in place a new management structure in order to secure the future of the centre.